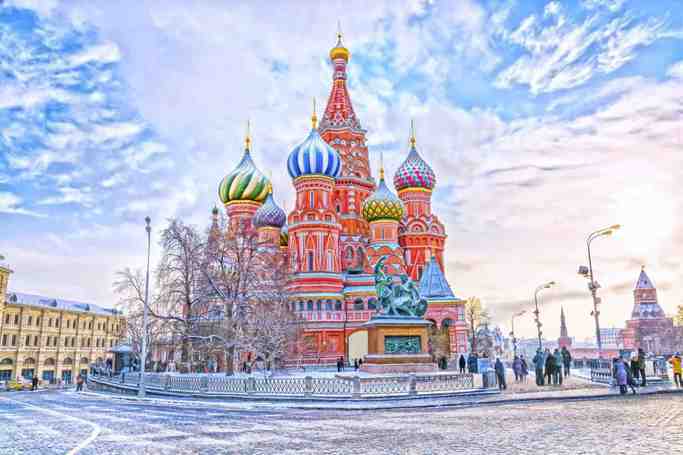 All-Russian Exhibition Centre is a permanent general-purpose trade show in Moscow, Russia. The exhibition was established February 17, 1935 as the All-Union Agricultural Exhibition (VSKhV). An existing site (then known as Ostankino Park, a country territory recently incorporated into the city limits), was approved in August, 1935. The master plan by Vyacheslav Oltarzhevsky was approved in April, 1936, and the first show season was announced to begin in July, 1937. However, plans did not materialize, and three weeks before the deadline Stalin personally postponed the exhibition by one year (to August 1938). 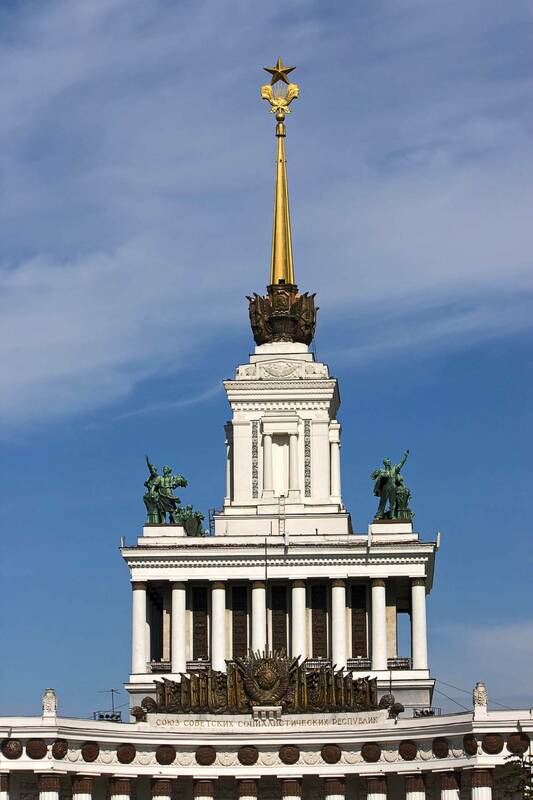 As a result, in August 1938 Nikita Khrushchev, speaking at the Supreme Soviet of the Soviet Union assembly, declared that the site is not ready, and the opening was extended to August, 1939. It opened indeed August 1, 1939, and worked in 8AM - 11PM mode until October 25 (40,000 daily attendance). 1940 and 1941 seasons followed; after the German invasion, July 1, 1941 the exhibition was closed - until the end of World War II. In October, 1948 the State ordered to renew the Exhibition, starting with the 1950 season. Again, the opening was postponed more than once; the first post-war season opened in 1954 (still as Agricultural exhibition). In 1956 season the planners set aside an Industrial area within the main territory; more restructuring and rebuilding followed. 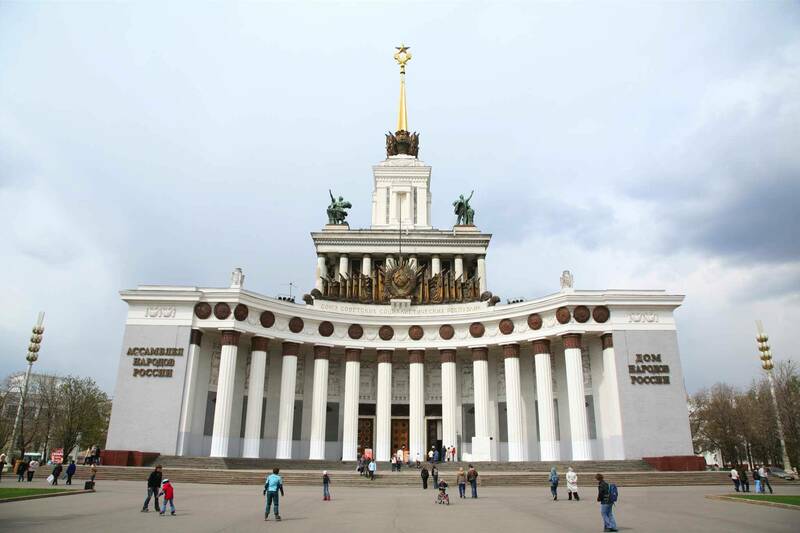 In 1959 the park was renamed Exhibition of Achievements of the National Economy VDNKh. By 1989 the exhibition had 82 pavilions with the exhibition area of 700,000 square metres. Each pavilion (including the 1939 "regions") had been dedicated to a particular industry or a field: the Engineering Pavilion (1954), the Space Pavilion (1966), the Atomic Energy Pavilion (1954), the People's Education Pavilion (1954), the Radioelectronics Pavilion (1958), the Soviet Culture Pavilion (1964). During the Soviet times, each year VDNKh hosted more than 300 national and international exhibitions and many conferences, seminars and meetings of scientists and industry professionals. These events attracted about 11 million visitors annually, including 600,000 guests from outside the Soviet Union. The "Radioelectronics" exhibition hall for some years housed the working (and unique) prototypes of the most advanced ES EVM computers to date, which were time-shared by many research organizations right on the premises. In 1992, VDNKh was renamed, receiving its current name VVC. It occupies 2,375,000 square metres of which 266,000 square metres are used for indoor exhibits. The territory of VVC is greater than that of the Principality of Monaco and has approximately 400 buildings. Inadequate maintenance of Vera Mukhina's statue caused such disrepair that the statue was disassembled. The term "VDNKh" is still in use, including the name of a nearby subway station. Currently, the larger international exhibitions are mostly held at the new facilities of Moscow Expo Center.